Those of you who enjoy action-RPGs may have heard of a little game by the now-defunct studio Iron Lore Entertainment called Titan Quest. Published by THQ in 2007, Titan Quest came at an interesting time - a dry spell between the prior king of action-RPGs, Diablo II, and the current cornucopia that we have today with the likes of Torchlight II, Path of Exile and Diablo III. At the time, Titan Quest received a mostly positive reception, but it found perhaps more acceptance beyond its initial release as word spread of "that game that does Diablo better than Diablo" - at least, according to some. Titan Quest aged rather well and is currently available for next to nothing, but after its expansion pack Immortal Throne, Iron Lore closed its doors. Those who wished for a Titan Quest sequel, it seems, would be stuck holding their breath. However, several Iron Lore veterans reformed sometime around 2009 as Crate Entertainment, and have been dutifully working away on their "spiritual follow-up" to Titan Quest. Backed up by a successful Kickstarter campaign and upgraded technology that powered their original game, Grim Dawn is both a departure from and a retread of the same ideas found in Titan Quest six years ago. Recently, I got the chance to spend an extended time with the game's closed beta (covering the first chapter), and with no strings attached, I'm able to report how the game is progressing after nearly four years in development. It's tradition to set action-RPGs in worlds which are on the brink of destruction, and Grim Dawn's land of Cairn is no exception. Civilization has been all but wiped out by the war between two factions far more powerful than humanity, the Aetherials and Chthonians. 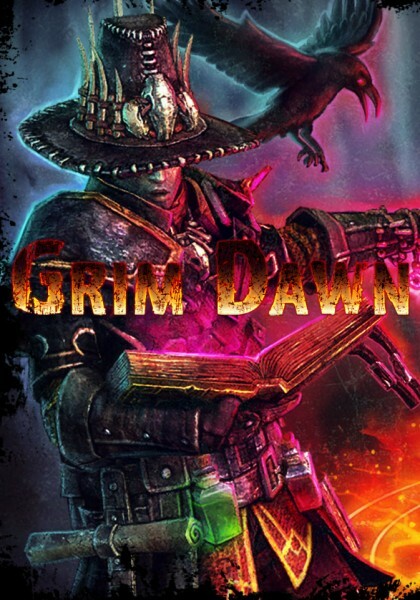 With one intent on using humans as weapons and the other bent on simply cleansing them from existence, it's fair to say that Grim Dawn is one of the bleaker games I've played recently. The theme of the game isn't necessarily fighting back to turn the tide, but to simply continue surviving in the destroyed world. Perhaps it's appropriate that the game's first town is an old, ruined prison at a crossroads called Devil's Crossing. You enter into that world as an anomaly - possessed for the ugly purposes of the Aetherials, a normally fatal process, you have been left with your life for unexplained reasons, but of course, you've also got amnesia to go along with the headache. Rather than see you hanged (the usual punishment fate of the possessed), the captain of the survivors at Devil's Crossing recruits you into his service, as you've got "nothing to lose and a lot to gain" in his words. From there, you'll help find and rescue other lost survivors, push deep into enemy territory and take the fight to just about everything standing in your way. Built on the Titan Quest engine, Grim Dawn, even in its current alpha state, is a beautiful and highly detailed game. Though it's set in a post-apocalyptic Victorian-esque setting, that doesn't mean that Crate Entertainment have ignored things like art style or color palette. Most of the locations available in the alpha include underground caverns, villages, swamps, and plains, but despite being relatively generic in theme, Grim Dawn's extremely detailed texture work and vibrant lighting help the world stand out. The creatures you fight run the gamut from predictable, like shambling zombies and skeletons, to more interesting and unconventional, including gigantic mosquitoes and floating beholders. None of it is especially creative or original, but there is very good creature variety and all of them animate fluidly and with personality. The spell effects, likewise, are colorful and easy to see, without being over the top. If there are some complaints right now to be made about the visuals, it's mostly in that all the grit in the world can sometimes make it hard to differentiate interactive elements of the environment from static ones. You'll likely miss a lot of containers, doors you can smash down, and so on until you've spent several hours with the game, and sometimes even enemies can get lost in the backgrounds. In screenshots and videos the game looks great, but while actually playing it I find myself wishing that the characters and interactive objects stood out more from the backgrounds - some extra shine or highlighting would go a long way. There's also a full day/night cycle that looks great, but without any gameplay effect, I often found the nights to be unnecessarily dark. The soundtrack, meanwhile, is also excellent. Haunting and atmospheric, but featuring more modern instrumentation than games like Titan Quest and Diablo, it is able to convey the feeling of a defeated, destroyed world, but one where hope has not completely faded. Composer Steve Pardo isn't a well-known name like Jeremy Soule or Matt Uelmen, but he clearly has some talent for this style of music. Grim Dawn's sound effects work is competent, with powerful impact sound effects and pleasant environment ambiance. Being a smaller production, there is a distinct lack of voice acting, and I admit it would be nice to have the more important characters voiced, or even simple Baldur's Gate-esque "hails" when talking to NPCs around town, but it's hardly a necessary feature.